Click here for past historic journals. Select the Month and Year to display in the journal in two/four month increments below (see illustration at bottom of page). If any of those dates have a House Journal associated with it you will see the day underlined and in red and clicking on the day will display the House Journal for that day in Adobe .PDF format. Normal journal session months are February through May with one day in January unless the House has a special/extra session during the other months. Extra session days have an 'x' after the day. Click on the single arrow at either end of the calendar heading to move the calendar four months at a time either forward or backward. 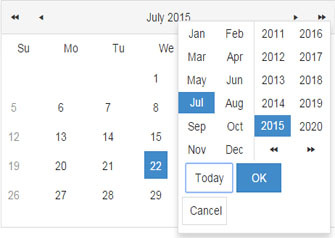 Click on the double arrows to move the calendar a year at a time either forward or backward.